The leg of the T should be white with a black stripe by the diagram. The other should be yellow. The WB wire is the one that should control your charge light. Not sure what's happening when you jump it like that, it shouldn't really do anything. It might be that you're running full current through a short in the alternator. The charge light is actually a resistor that controls current flow through that circuit. Kind of sounds like you have two problems - a bad connection to the BAT terminal, and a bad alternator. Parts store alternators have been known to be bad out of the box. I'd get it tested. I think that shows a high resistance in the line from the BAT terminal to the battery. That cable runs to the starter lug, then the positive cable runs up to the battery. Could just be a loose connection at the starter terminal or bad positive connection at the battery. It's a good test though, you have a problem somewhere along the way. Forgot about the black fusible link also. It could be bad or have a bad connection. It's on the way to the battery from the BAT terminal. Yeah not a big deal on the price. I think I paid $150 for them. Mainly want to sell the $600 Nittos on them. I just want to be able to tell someone what they are. If the car doesn't already have one, an inertial cutoff switch is a good idea. I have both a manual switch and an automatic inertial cutoff switch in my fuel pump circuitry. Well my kid (it's his car really) told me to leave the pump alone, he doesn't mind the buzz so I'm letting that one be. I'm running both in my mild SBC. The stock mech pump is fine for street use, but I need the electric pump for any kind of track use. I'm using an Edelbrock pump, 38 gph, 4-7 psi. Hi, I have a 78 s30. Been working on the car recently and noticed the alternator isn't charging the battery, and the red charge light is on w/ the voltage reading about 6 on the stock gauge. When the car is running w/ no accessories on, voltage of the battery is at around 12.2-12.35v. Read through the electrical section of the FSM. With the car running, POS point on tester to battery, and NEG point of tester to the point on the alternator that says BAT, the tester reads 10.35??? This doesn't seem right, A pos and a pos shouldn't read a voltage like that, right? Think the alternator could be grounded out somewhere in the 40+ year old wiring? This alternator is 10 months old. You can report them to the Better Business Bureau if they are a licensed business. Hybridz used to have some things about Vendors and how they would deal with the bad ones. But the Rules and Guidelines aren't available anymore. I did receive a refund, thanks to Pay Pal. Not even an apology or explanation from Paulo. People like this shouldn't be allowed to present themselves as vendors. I see people on Facebook requesting parts for their Z cars on Retro-Specs page and I wish there was a way to warn them. I ordered the AE crossmember unpainted, then just cut off the bases for the stock rack mounts, and welded on a mount to fit the Woodward rack. There are a few pictures of this on page 4 of this thread. The Woodward rack is very easy to make a mount for, basically all you need is a piece of .25" steel plate. I added braces below to stiffen things up, but this was probably overkill. I ordered the Woodward rack in a significantly quicker ratio than the stock Datsun rack, but I also just wanted another option than my stock rack. It was very tired and loose, most of the parts needed to rebuild it are NLA, and I just wanted an aftermarket option rather than trying to deal with 45 year old parts. This has been the case with most of the build....not too much OEM Datsun stuff is left. I think that Motorsport Auto used to sell their own brand of lowering springs that were blue. Nissan/Datsun springs are black with a colored paint splotch on them. The springs aren't really difficult to change. 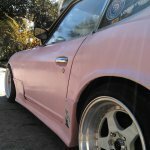 The 240Z's have enough room to swing the strut out and take the top off, without disconnecting the control arm. Once you get started though you usually find a bunch of other stuff that needs doing. This thread is awesome, getting close! Interested to know more on what you ordered from Woodward. Did you modify the AE front crossmember to use that rack or was the single bolt style mounting an AE option? It looks like it may be an aftermarket spring. If it's loose in the perch when the wheel is off the ground, it's definitely a lowering spring. Many Z owners have used the 1st gen. Mazda RX7 (80-81) elec. fuel pumps. They are quiet, cheap and avail. at any chain parts store. The carter fuel pump is so obnoxiously loud. I think the ZZ4 has a spot for a mechanical pump, was thinking of installing both, switching the electric to use as a primer if needed but leaving it off otherwise. Research says this is doable. Might be a lot of needless work and risk just to shut up the stupid pump. I'm pretty sure a standard mechanical pump at 7psi should supply the juice just fine, could be wrong. Something like this https://www.summitracing.com/parts/crt-m4685/overview/year/1967/make/chevrolet If the mechanical failed and you resorted to electric and pumped your gas tank into your crankcase, that would be bad. pulled left rear wheel, this is what I see, so far I just cheated with a couple coil spring blocks, no idea what I'm looking at, it's blue.